Golkar, P., Mosavat*, N. (2017). Identification of chemical components in Zataria multiflora callus by GC-Mass analysis. 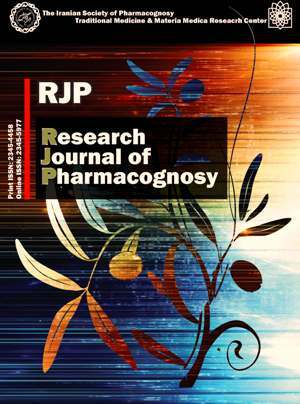 Research Journal of Pharmacognosy, 4(Supplement), 46-46. P. Golkar; N. Mosavat*. "Identification of chemical components in Zataria multiflora callus by GC-Mass analysis". Research Journal of Pharmacognosy, 4, Supplement, 2017, 46-46. Golkar, P., Mosavat*, N. (2017). 'Identification of chemical components in Zataria multiflora callus by GC-Mass analysis', Research Journal of Pharmacognosy, 4(Supplement), pp. 46-46. Golkar, P., Mosavat*, N. Identification of chemical components in Zataria multiflora callus by GC-Mass analysis. Research Journal of Pharmacognosy, 2017; 4(Supplement): 46-46. Research Institute for Biotechnology and Bioengineering, Isfahan University of Technology, Isfahan, Iran. Background and objectives: A modern biotechnological technique to obtain useful natural products from plants is to isolate them from their callus. Zataria multiflora is a bushy herb of the Lamiaceae family known for its stimulant, antibacterial, antioxidant and expectorant effects in Iranian folk medicine. The present study has investigated the induction of callus tissue and identification of its chemical compounds by GC-Mass analysis. Methods: The plant seeds of were sterilized and cultured in petri dishes lined with MS medium. After the emergence of seedlings, leaf segments were transferred to another MS medium supplemented with 2 mg/L 2,4- Dichlorophenoxyacetic acid + 1 mg/L Kinetin. The petri dishes were incubated in a growth chamber at 24 °C with photoperiod of 16/8 (light/dark). The methanol extract of the calli were extracted after 2 month of callus induction and the chemicals were analyzed by gas chromatography-mass spectrometry (GC-MS). Reults: GC-MS analysis showed 20 different compound including different fatty acids, phytosterolls and phenolic compounds. Linolenic acid methyl ester (13.38%), thymol (10.34%), cyclohexasiloxane dodecamethyl (7.50%) and р-cymen (7.30%) were the dominant compounds, respectively. Conclusion: This novel finding showed that in vitro production of thymol and other terpenoids by callus culture could be optimized for wide industrial and pharmaceutical applications via bioreactor systems employment.